By Alan Green in Salt Lake Potash (SO4) on 28th September 2018 . AIM and ASX listed company Salt Lake Potash Limited (“SO4” or the “Company”), announces its results for the year ended 30 June 2018. The Company’s Report and Accounts can be viewed at www.saltlakepotash.com.au. The Company also advises that an Appendix 4G (Key to Disclosures: Corporate Governance Council Principles and Recommendations) and the 2018 Corporate Governance Statement have been released today and are available on the Company’s website: www.saltlakepotash.com.au/corporate-governance/. 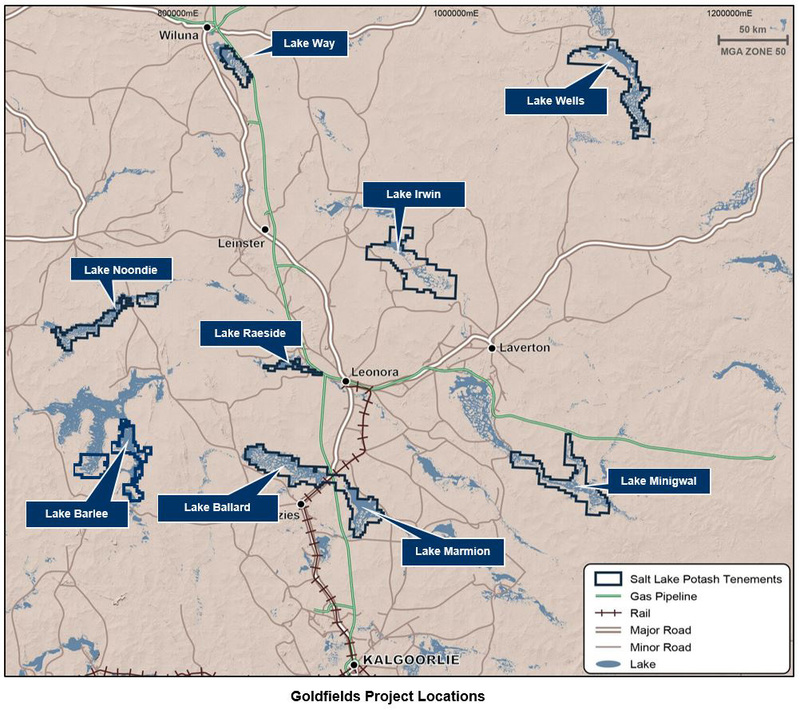 · The Company entered into a Memorandum of Understanding (MOU) with Blackham Resources Limited (Blackham) to investigate the potential development of a SOP operation based at Lake Way, near Wiluna. Pursuant to the MOU with Blackham, the Company would construct an initial pond system to dewater Blackham’s Williamson Pit, which contains approximately 1.2GL of super-saturated brine, with a very high average SOP content of 25kg/m3. These Williamson Ponds would comprise approximately 1/3 of the total Demonstration Plant pond area, and dewatering of the Williamson Pit offers a shorter development time due to its very high grade and salt saturation. · The Company completed a Scoping Study on the development of a 50,000tpa SOP Demonstration Plant at Lake Way that supports a low capex, highly profitable, staged development model, with total capital costs of approximately A$49m and average cash operating costs (FOB) of approximately A$387/t. · The Company completed pilot scale crystalliser validation testwork at a leading crystalliser vendor in the United States, processing approximately 400 kg of crystalliser feed salt (schoenite concentrate), produced from previous Lake Wells development work at Saskatchewan Research Council (SRC). The testwork successfully produced high quality SOP crystals, representative of a full scale plant product. · The Site Evaporation Trial (SET) at Lake Wells was decommissioned after completing over 18 months of operation under site conditions and through all seasons. The SET processed approximately 412 tonnes of brine and produced over 10 tonnes of harvest salts. · Subsequent to year end, the Company and Australian Potash Limited (ASX: APC) entered into a Memorandum of Understanding and Co-operation Agreement to undertake a joint study of the potential benefits of development cost sharing for each Company’s projects at Lake Wells. 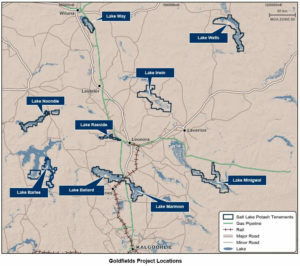 · The Company’s first Mining Lease at Lake Wells was granted subsequent to year end, a significant milestone in the Projects development pathway. · An initial surface aquifer exploration program was completed at Lake Ballard, comprising a total of 160 shallow test pits and 10 test trenches. This work provides preliminary data for the geological and hydrological models for the surface aquifer of the Lake, as well as brine, geological and geotechnical samples. · Subsequent to year end exploration drilling and excavation continued with a view to reporting an initial JORC mineral resource estimate for the shall aquifer. · A surface aquifer exploration program was completed at Lake Irwin, comprising 56 shallow test pits and 5 test trenches. This work provides preliminary data for the geological and hydrological models of the surface aquifer of the Lake, as well as brine, geological and geotechnical samples. · The Company undertook initial surface brine sampling of the near surface aquifer and reconnaissance of access and infrastructure at all remaining Lakes held under the GSLP. · The Company executed its first MOU for an Offtake Agreement with Mitsubishi, for the sales and offtake rights for up to 50% of the SOP production, from a Demonstration Plant at the GSLP, for distribution into Asia and Oceania and potentially other markets. · The Company released an initial estimate of Exploration Targets for eight of the nine lakes comprising the Company’s GSLP. The ninth lake, Lake Wells, already having a Mineral Resource reported in accordance with the JORC code. The Company is the owner of the Goldfields Salt Lakes Project (GSLP), which comprises nine large salt lakes in the Northern Goldfields Region of Western Australia. · The total “stored” Exploration Target for the GSLP is 290Mt – 458Mt of contained Sulphate of Potash (SOP) with an average SOP grade of 4.4 – 7.1kg/m3 (including Lake Wells’ Mineral Resource of 80-85Mt). On a “drainable” basis the total Exploration Target ranges from 26Mt – 153Mt of SOP. [The potential quantity and grade of this Exploration Target is conceptual in nature. There has been insufficient exploration to estimate a Mineral Resource and it is uncertain if further exploration will result in the estimation of a Mineral Resource]. · Potential co-product revenues, particularly where transport costs are lowest. The Company’s long term plan is to develop an integrated SOP operation of global scale, producing high quality organic SOP from a number (or all) of the lakes within the GSLP, after confirming the technical and commercial elements of the Project through construction and operation of a Demonstration Plant producing up to 50,000tpa of SOP. · Market acceptance of a new product in conservative agricultural markets is best achieved progressively and in conjunction with existing, established partner(s). It is important to establish Salt Lake’s product(s) as premium, sustainable nutrients in the key long-term markets, and staged production increments are the best way to achieve this objective. · A Demonstration Plant offers an accelerated pathway to initial production, with limited infrastructure requirements and a faster, simpler approval process. The Demonstration Plant is intended to operate for 12-24 months to establish parameters for larger scale production, and then be integrated into a larger operation. The Company’s objective is to commence construction in 2018, harvesting first salts in 2019, and producing first SOP in 2020. Salt Lake holds two Exploration Licences (one granted and one under application) covering most of Lake Way, including the paleochannel defined by previous exploration. The Northern end of the Lake is largely covered by a number of Mining Leases, held by Blackham Resources Limited (Blackham), the owner of the Wiluna Gold Mine. The Company entered into a Memorandum of Understanding with Blackham in March 2018 to investigate the development of an SOP operation on Blackham’s existing Mining Leases at Lake Way, including initially a 50,000tpa Demonstration Plant. The Demonstration Plant is supported by an Indicated and Measured Mineral Resource (drainable) within the Blackham mining lease area totalling 500,000t (Stored Resource – 2Mt), a multiple of the resource required to support a 50,000tpa Demonstration Plant for 2-3 years. Pursuant to the MOU with Blackham, the Company will construct an initial pond system to dewater the Williamson Pit, which contains approximately 1.2GL of super-saturated brine, with a very high average SOP content of 25kg/m3. These Williamson Ponds will comprise approximately 1/3 of the total Demonstration Plant pond area, and dewatering of the Williamson Pit offers a shorter development time due to its very high grade and saturation. The Company undertook a range of process development testwork to enhance the process model for both Lake Way and Lake Wells. A large scale, continuous Site Evaporation Trial (SET) at Lake Wells was successfully completed over 18 months of operation under site conditions and through all seasons. The results of the SET are an Australian first and have provided significant knowledge to the Company on the salt crystallisation pathway under site conditions in Australia. The SET processed approximately 412 tonnes of Lake Wells brine and produced 10.3 tonnes of harvest salts. Site-produced harvest salts have been used in a range of subsequent process development testwork programs. The Company has used the harvest salts produced by the SET to perform comprehensive process development testwork at Saskatchewan Research Council (SRC). Most recently, SRC completed locked cycle testwork that validated the SysCAD process flowsheet and demonstrated that the process converges quickly to operate at steady state. In addition to locked cycle testing, 1,000kg of harvest salts from Lake Wells SET were processed by SRC to produce approximately 350kg of the flotation concentrate (crystalliser feed salt) which was then provided to a globally recognized crystalliser vendor for crystalliser testwork and equipment design. The tests generated samples with large chrystal size, similar to full scale production, and allowed the vendor to refine the design and pricing of a key process equipment item. Building on the knowledge gained from the Lake Wells project, a staged engineering approach was used in the process development for Lake Way, whereby initial evaporation modelling was undertaken followed by laboratory tests and then field trials. The initial brine evaporation modelling, conducted by international solar pond experts, Ad Infinitum, indicated that the predicted harvest salts produced at Lake Way are comparable to those produced at Lake Wells (containing a mix of Halite, Kainite and Schoenite) and therefore suitable for conversion into SOP. Laboratory evaporation tests were conducted by international laboratory and testing company, Bureau Veritas (BV), to validate the evaporation model. BV completed a series of laboratory-scale brine evaporation trials at their Perth facility, under simulated average Lake Way climate conditions. This testwork confirmed the modelled brine evaporation pathways. Furthermore it demonstrated that the Williamson pit brine follows a similar evaporation pathway to Lake Way lake brine with similar brine chemistry and salts produced. This indicates that the Williamson Pit brine is a pre-concentrated version of the Lake Way brine, which provides the advantage of a large volume of brine that is essentially accelerated in the evaporation pathway. A range of process development testwork to provide and validate inputs to the Lake Way Scoping Study production model was also undertaken, including field evaporation tests and metallurgical processing testwork on harvest salts. The testwork incorporates brines from the Lake itself, as well as the super-concentrated brines from the Williamson Pit. The results of testwork undertaken to date support the Company’s aim to produce an organic premium SOP product from the GSLP. Salt Lake continues to progress testwork to refine products in line with offtake partner expectations. Salt Lake Potash is progressing its GSLP development strategy, initially involving construction of a Demonstration Plant producing up to 50,000tpa of high quality SOP, with its plans to distribute production through a small number of global distribution partnerships. (iii) Business development expenses of $1,110,578 (2017: $559,247) which are attributable to additional business development and investor relations activities required to support the growth and development of the Goldfields Salt Lakes Project, including travel costs associated with representing the Company at international conferences and investor meetings. As at the date of this report, the Company had working capital in excess of $4 million which includes cash and cash equivalents. At 30 June 2018, the Company had cash reserves of $5,709,446 (2017: $15,596,759). At 30 June 2018, the Company had net assets of $7,019,989 (2017: $17,046,443), a decrease of 59% compared with the previous year. This decrease is a result of the exploration and evaluation activity during the year, which has been expensed as discussed in the results of operations section above. The objective of the Group is to create long-term shareholder value through the discovery, exploration and development of its projects. (vi) Continue additional exploration activities including drilling, test pumping and other testwork across the Company’s multi lake portfolio. Global financial conditions may adversely affect the Company’s growth and profitability – Many industries, including the mineral resource industry, are impacted by these market conditions. Some of the key impacts of the current financial market turmoil include contraction in credit markets resulting in a widening of credit risk, devaluations and high volatility in global equity, commodity, foreign exchange and precious metal markets, and a lack of market liquidity. Due to the current nature of the Company’s activities, a slowdown in the financial markets or other economic conditions may adversely affect the Company’s growth and ability to finance its activities. If these increased levels of volatility and market turmoil continue, the Company’s activities could be adversely impacted and the trading price of the Company’s shares could be adversely affected. (i) On 18 August 2017, the Company issued 42,000 shares to an advisor as part of their annual fees. (ii) On 17 November 2017, the Company issued 1,100,000 incentive options to a key consultant as an incentive to attract and retain their services. (iii) On 1 December 2017, Mr Mark Hohnen retired as a Non-Executive Director of the Company. (iv) On 22 December 2017, the Company issued 2,300,000 performance rights to key employees and consultants of the Company pursuant to the Salt Lake Potash Limited Performance Rights Plan, and 800,000 incentive options to a key consultant as an incentive to attract and retain their services. (v) On 12 March 2018, the Company entered a Memorandum of Understanding (MOU) with Blackham Resources Limited (Blackham) to investigate the potential development of a Sulphate of Potash (SOP) operation based at Lake Way, near Wiluna. Under the MOU, the Company will acquire Blackham’s brine rights and Blackham will acquire gold rights to the Company’s Lake Way holdings, with each company retaining a royalty on their respective holdings. (vi) On 9 April 2018, the Company announced that it had executed a Memorandum of Understanding with Mitsubishi Australia Limited and Mitsubishi Corporation (Mitsubishi), setting out the basis for the first Offtake Agreement for the Goldfields Salt Lakes Project. The formal Offtake Agreement will provide Mitsubishi with sales and offtake rights for up to 50% of the Sulphate of Potash (SOP) production from a Demonstration Plant at the GSLP, for distribution into Asia and Oceania and potentially other markets. (iii) On 14 September 2018, the Company announced that it entered into a Memorandum of Understanding and Co-operation Agreement with Australian Potash Limited (ASX: APC) to study the potentially very substantial benefits of sharing infrastructure and other costs at Lake Wells. No dividends were paid or declared since the start of the financial year. No recommendation for payment of dividends has been made. 1 Ordinary Shares means fully paid Ordinary Shares in the capital of the Company. 2 Incentive Options means an unlisted share option to subscribe for one Ordinary Share in the capital of the Company. 3 Performance Rights means Performance Rights issued by the Company that convert to one Ordinary Share in the capital of the Company upon satisfaction of various performance conditions. · 1,350,000 Performance Rights subject to the Production Milestone expiring on 30 June 2021. During the year ended 30 June 2018, no Ordinary Shares have been issued as a result of the exercise of Unlisted Options, and no Ordinary Shares have been issued as a result of the conversion of Performance Shares or Rights. Subsequent to year end and until the date of this report, no Ordinary Shares have been issued as a result of the exercise of Unlisted Options. The significant accounting policies adopted in preparing the financial report of Salt Lake Potash Limited (Salt Lake or Company) and its consolidated entities (Consolidated Entity or Group) for the year ended 30 June 2018 are stated to assist in a general understanding of the financial report. Salt Lake is a Company limited by shares incorporated and domiciled in Australia whose shares are publicly traded on the Australian Securities Exchange (ASX), and the AIM Market (AIM) of the London Stock Exchange. The financial report of the Group for the year ended 30 June 2018 was authorised for issue in accordance with a resolution of the Directors on 26 September 2018. The financial report is a general purpose financial report, which has been prepared in accordance with Australian Accounting Standards (“AASBs”) and other authoritative pronouncements of the Australian Accounting Standards Board (“AASB”) and the Corporations Act 2001. The Group is a for-profit entity for the purposes of preparing the consolidated financial statements. The financial report has been prepared on a historical cost basis. The financial report is presented in Australian dollars. The consolidated financial statements have been prepared on a going concern basis which assumes the continuity of normal business activity and the realisation of assets and the settlement of liabilities in the ordinary course of business. For the year ended 30 June 2018, the Consolidated Entity incurred a net loss of $11,327,108 (2017: $9,654,977) and experienced net cash outflows from operating and investing activities of $9,821,628 (2017: $8,586,094). As at 30 June 2018, the Group had cash and cash equivalents of $5,709,446 (2017: $15,596,759) and net current assets of $4,246,901 (2017: $14,515,834). The Company has recently completed a successful Scoping Study for the Lake Way Demonstration Plant and is currently in the process of finalising parameters for the Pre-Feasibility Study and construction of holding ponds to dewater Blackham’s Williamson Pit. The Scoping Study on the development of a 50,000tpa sulphate of potash (SOP) Demonstration Plant at Lake Way supports a low capex, highly profitable, staged development model. In order to continue to progress the Demonstration Plant at Lake Way and ongoing studies for the wider GSLP, the Company will be required to raise additional capital during the current financial year. Based on the successful results of the Scoping Study and having previously raised funds for the GSLP, the Directors are confident that they will be able to raise additional capital as and when required to continue to fund operations. In addition, the Directors have been involved in a number of recent successful capital raisings for other listed resource companies, and accordingly, they are satisfied that they will be able to raise additional capital when required to enable the Consolidated Entity to meet its obligations as and when they fall due, and accordingly, consider that it is appropriate to prepare the financial statements on the going concern basis. Should the Consolidated Entity be unable to raise additional capital as and when required, the Consolidated Entity would need to reduce operational expenditure to continue as a going concern. In the event that the Consolidated Entity is unable to achieve the matters referred to above, uncertainty would exist that may cast doubt on the ability of the Consolidated Entity to continue as a going concern. These consolidated financial statements do not include any adjustments relating to the recoverability and classification of recorded asset amounts, or to the amounts and classification of liabilities that might be necessary should the Consolidated Entity be unable to continue as a going concern. The financial report complies with Australian Accounting Standards and International Financial Reporting Standards (IFRS) as issued by the International Accounting Standards Board. In the current year, the Group has adopted all of the new and revised Standards and Interpretations issued by the AASB that are relevant to its operations and effective for the current annual reporting period. · AASB 2017-2 Amendments to Australian Accounting Standards – Further Annual Improvements 2016-2016 Cycle which clarify the existing disclosure requirements and scope of AASB 12 Disclosure of Interest in Other Entities to apply to interests that are classified as held for sale or distribution. The adoption of these new and revised standards has not resulted in any significant changes to the Group’s accounting policies or to the amounts reported for the current or prior periods. Australian Accounting Standards and Interpretations that have recently been issued or amended but are not yet effective have not been adopted by the Group for the annual reporting period ended 30 June 2018. Those which may be relevant to the Group are set out in the table below. · The Group’s main operating lease is for office space, currently at a cost of $10,170 per month. Under AASB 16, an asset (the right to use the leased item) and a financial liability to pay rentals will be recognised. AASB 16 will not apply to short term contracts of less than 12 months. The consolidated financial statements incorporate the assets and liabilities of all subsidiaries of the Company as at 30 June 2018 and the results of all subsidiaries for the year then ended. Subsidiaries are all entities (including structured entities) over which the group has control. The group controls an entity when the group is exposed to, or has rights to, variable returns from its involvement with the entity and has the ability to affect those returns through its power to direct the activities of the entity. The financial statements of the subsidiaries are prepared for the same reporting period as the Company, using consistent accounting policies. Accounting policies of subsidiaries have been changed where necessary to ensure consistency with the policies adopted by the Company. Subsidiaries are fully consolidated from the date on which control is transferred to the Company. They are de-consolidated from the date that control ceases. Intercompany transactions and balances, income and expenses and profits and losses between Group companies, are eliminated. Cash and cash equivalents include cash on hand, deposits held at call with banks and other short-term highly liquid investments with original maturities of three months or less. Trade receivables are recognised and carried at the original invoice amount less a provision for any uncollectable debts. An estimate for doubtful debts is made when collection of the full amount is no longer probable. Bad debts are written‑off as incurred. Short term receivables from related parties are recognised and carried at the nominal amount due and are interest free. Financial assets in the scope of AASB 139 Financial Instruments: Recognition and Measurement are classified as either financial assets at fair value through profit or loss, loans and receivables, held-to-maturity investments, or available-for-sale investments, as appropriate. When financial assets are recognised initially they are measured at fair value, plus, in the case of investments not at fair value through profit or loss, directly attributable transaction costs. The Group determines the classification of its financial assets after initial recognition and, when allowed and appropriate, re-evaluates this designation at each financial year-end. Loans and receivables are non-derivative financial assets with fixed or determinable payments that are not quoted in an active market. They arise when the Group provides money, goods or services directly to a debtor with no intention of selling the receivable. They are included in current assets, except for those with maturities greater than twelve months after the reporting date which are classified as non-current assets. Loans and receivables are included in receivables in the statement of financial position. Loans and receivables are carried at amortised cost using the effective interest rate method. Collectability of trade and other receivables is reviewed on an ongoing basis. Individual debts that are known to be uncollectible are written off when identified. An impairment allowance is recognised when there is objective evidence that the Consolidated Entity will not be able to collect the receivable. Financial difficulties of the debtor, default payments or debts more than 60 days overdue are considered objective evidence of impairment. The amount of the impairment loss is the receivable carrying amount compared to the present value of estimated future cash flows, discounted at the original effective interest rate. All classes of property, plant and equipment are measured at historical cost. Plant and equipment is stated at historical cost less accumulated depreciation and any accumulated impairment losses. Such cost includes the cost of replacing parts that are eligible for capitalisation when the cost of replacing the parts is incurred. Similarly, when each major inspection is performed, its cost is recognised in the carrying amount of the plant and equipment as a replacement only if it is eligible for capitalisation. All other repairs and maintenance are recognised in the Statement of Profit or Loss and other Comprehensive Income as incurred. Depreciation is provided on a straight line basis on all property, plant and equipment. The assets’ residual values, useful lives and amortisation methods are reviewed, and adjusted if appropriate, at each financial year end. Expenditure on exploration and evaluation is accounted for in accordance with the ‘area of interest’ method. Exploration and evaluation expenditure encompasses expenditures incurred by the Group in connection with the exploration for and evaluation of mineral resources before the technical feasibility and commercial viability of extracting a mineral resource are demonstrable. · exploration and evaluation activities in the area of interest have not at the reporting date reached a stage which permits a reasonable assessment of the existence or otherwise of economically recoverable reserves, and active and significant operations in, or in relation to, the area of interest are continuing. Exploration and evaluation expenditure incurred by the Group subsequent to acquisition of the rights to explore is expensed as incurred, up to costs associated with the preparation of a feasibility study. Capitalised exploration costs are reviewed each reporting date to establish whether an indication of impairment exists. If any such indication exists, the recoverable amount of the capitalised exploration costs is estimated to determine the extent of the impairment loss (if any). Where an impairment loss subsequently reverses, the carrying amount of the asset is increased to the revised estimate of its recoverable amount, but only to the extent that the increased carrying amount does not exceed the carrying amount that would have been determined had no impairment loss been recognised for the asset in previous years. Where a decision is made to proceed with development, accumulated expenditure is tested for impairment and transferred to development properties, and then amortised over the life of the reserves associated with the area of interest once mining operations have commenced. Recoverability of the carrying amount of the exploration and evaluation assets is dependent on successful development and commercial exploitation, or alternatively, sale of the respective areas of interest. Liabilities are recognised for amounts to be paid in the future for goods and services received. Trade accounts payable are normally settled within 60 days. Payables are carried at amortised cost. Provisions are recognised when the group has a legal or constructive obligation, as a result of past events, for which it is probable that an outflow of economic benefits will result and that outflow can be reliably measured. Interest revenue is recognised on a time proportionate basis that takes into account the effective yield on the financial assets. The income tax expense for the period is the tax payable on the current period’s taxable income based on the national income tax rate for each jurisdiction adjusted by changes in deferred tax assets and liabilities attributable to temporary differences between the tax bases of assets and liabilities and their carrying amounts in the financial statements, and to unused tax losses. Deferred tax assets and liabilities are recognised for temporary differences at the tax rates expected to apply when the assets are recovered or liabilities are settled, based on those tax rates which are enacted or substantively enacted for each jurisdiction. The relevant tax rates are applied to the cumulative amounts of deductible and taxable temporary differences to measure the deferred tax asset or liability. An exception is made for certain temporary differences arising from the initial recognition of an asset or a liability. No deferred tax asset or liability is recognised in relation to these temporary differences if they arose on goodwill or in a transaction, other than a business combination, that at the time of the transaction did not affect either accounting profit or taxable profit or loss. Deferred tax liabilities and assets are not recognised for temporary differences between the carrying amount and tax bases of investments in controlled entities where the Company is able to control the timing of the reversal of the temporary differences and it is probable that the differences will not reverse in the foreseeable future. Deferred tax assets are recognised for deductible temporary differences and unused tax losses only if it is probable that future taxable amounts will be available to utilise those temporary differences and losses. The carrying amount of deferred income tax assets is reviewed at each reporting date and reduced to the extent that it is no longer probable that sufficient taxable profit will be available to allow all or part of the deferred income tax asset to be utilised. Unrecognised deferred income tax assets are reassessed at each balance date and are recognised to the extent that it has become probable that future taxable profit will allow the deferred tax asset to be recovered. Current and deferred tax balances attributable to amounts recognised directly in equity are also recognised directly in equity. Deferred tax assets and deferred tax liabilities are offset only if a legally enforceable right exists to set off current tax assets against tax liabilities and the deferred tax liabilities relate to the same taxable entity and the same taxation authority. Salt Lake Potash Limited and its wholly-owned Australian subsidiaries have formed an income tax consolidated group under the tax consolidation regime. Each entity in the group recognises its own current and deferred tax liabilities, except for any deferred tax assets resulting from unused tax losses and tax credits, which are immediately assumed by the Company. The current tax liability of each group entity is then subsequently assumed by the Company. The tax consolidated group has entered a tax sharing agreement whereby each company in the Group contributes to the income tax payable in proportion to their contribution to the net profit before tax of the tax consolidated group. Provision is made for the Group’s liability for employee benefits arising from services rendered by employees to balance date. Employee benefits that are expected to be settled within 12 months have been measured at the amounts expected to be paid when the liability is settled, plus related on-costs. Employee benefits expected to be settled more later than 12 months after the year end have been measured at the present value of the estimated future cash outflows to be made for those benefits. Basic earnings per share (EPS) is calculated by dividing the net profit attributable to members of the Company for the reporting period, after excluding any costs of servicing equity, by the weighted average number of Ordinary Shares of the Company, adjusted for any bonus issue. Diluted EPS is calculated by dividing the basic EPS earnings, adjusted by the after tax effect of financing costs associated with dilutive potential Ordinary Shares and the effect on revenues and expenses of conversion to Ordinary Shares associated with dilutive potential Ordinary Shares, by the weighted average number of Ordinary Shares and dilutive Ordinary Shares adjusted for any bonus issue. Revenues, expenses and assets are recognised net of the amount of GST, except where the amount of GST incurred is not recoverable from the Australian Tax Office. In these circumstances the GST is recognised as part of the cost of acquisition of the asset or as part of the expense. Receivables and payables in the statement of financial position are shown inclusive of GST. Cash flows are presented in the cash flow statement on a gross basis, except for the GST component of investing and financing activities, which are disclosed as operating cash flows. A group of assets may be acquired in a transaction which is not a business combination. In such cases the cost of the group is allocated to the individual identifiable assets (including intangible assets that meet the definition of and recognition criteria for intangible assets in AASB 138) acquired and liabilities assumed on the basis of their relative fair values at the date of purchase. The Group assesses at each reporting date whether there is an indication that a non-current asset may be impaired. If any such indication exists, or when annual impairment testing for an asset is required, the Group makes an estimate of the asset’s recoverable amount. An asset’s recoverable amount is the higher of its fair value less costs of disposal and its value in use and is determined for an individual asset, unless the asset does not generate cash inflows that are largely independent of those from other assets or groups of assets and the asset’s value in use cannot be estimated to be close to its fair value. In such cases the asset is tested for impairment as part of the cash-generating unit to which it belongs. When the carrying amount of an asset or cash-generating unit exceeds its recoverable amount, the asset or cash-generating unit is considered impaired and is written down to its recoverable amount. In assessing the value in use, the estimated future cash flows are discounted to their present value using a pre-tax discount rate that reflects current market assessments of the time value of money and the risks specific to the asset. An assessment is also made at each reporting date as to whether there is any indication that previously recognised impairment losses may no longer exist or may have decreased. If such indication exists, the recoverable amount is estimated. A previously recognised impairment loss is reversed only if there has been a change in the estimates used to determine the asset’s recoverable amount since the last impairment loss was recognised. If that is the case the carrying amount of the asset is increased to its recoverable amount. That increased amount cannot exceed the carrying amount that would have been determined, net of depreciation, had no impairment loss been recognised for the asset in prior years. Such reversal is recognised in profit or loss. After such a reversal the depreciation charge is adjusted in future periods to allocate the asset’s revised carrying amount, less any residual value, on a systematic basis over its remaining useful life. Ordinary Shares are classified as equity. Issued and paid up capital is recognised at the fair value of the consideration received by the Company. The functional currency of each of the Group’s entities is measured using the currency of the primary economic environment in which that entity operates. The consolidated financial statements are presented in Australian dollars which is the Company’s functional and presentation currency. Foreign currency transactions are translated into functional currency using the exchange rates prevailing at the date of the transaction. Foreign currency monetary items are translated at the year-end exchange rate. Non-monetary items measured at historical cost continue to be carried at the exchange rate at the date of the transaction. Exchange differences arising on the translation of monetary items are recognised in the Statement Profit or Loss and other Comprehensive Income, except where deferred in equity as a qualifying cash flow or net investment hedge. Exchange differences arising on the translation of non-monetary items are recognised directly in equity to the extent that the gain or loss is directly recognised in equity, otherwise the exchange difference is recognised in the other Comprehensive Income. · items of equity are translated at the historical exchange rates prevailing at the date of the transaction. Exchange differences arising on translation of foreign operations are transferred directly to the group’s foreign currency translation reserve in the statement of financial position. These differences are recognised in the Statement of Profit or Loss and other Comprehensive Income in the period in which the operation is disposed. Equity-settled share-based payments are provided to officers, employees, consultants and other advisors. These share-based payments are measured at the fair value of the equity instrument at the grant date. Fair value is determined using the Binomial option pricing model. Further details on how the fair value of equity-settled share based payments has been determined can be found in Note 20. The fair value determined at the grant date is expensed on a straight-line basis over the vesting period, based on the Company’s estimate of equity instruments that will eventually vest. At each reporting date, the Company revises its estimate of the number of equity instruments expected to vest. The impact of the revision of the original estimates, if any, is recognised in profit or loss over the remaining vesting period, with a corresponding adjustment to the share based payments reserve. Equity-settled share-based payments may also be provided as consideration for the acquisition of assets. Where Ordinary Shares are issued, the transaction is recorded at fair value based on the quoted price of the Ordinary Shares at the date of issue. The acquisition is then recorded as an asset or expensed in accordance with accounting standards. The preparation of the financial report requires management to make judgements, estimates and assumptions that affect the application of accounting policies and the reported amounts of assets, liabilities, income and expenses. Actual results may differ from these estimates. The estimates and underlying assumptions are reviewed on an ongoing basis. Revisions to accounting estimates are recognised in the period in which the estimate is revised if the revision affects only that period, or in the period of the revision and future periods if the revision affects both current and future periods. The Consolidated Entity operates in one operating segment and one geographical segment, being mineral exploration in Australia. This is the basis on which internal reports are provided to the Directors for assessing performance and determining the allocation of resources within the Consolidated Entity. 1 During the 2017 year, the Company sold its United States subsidiary, Golden Eagle Uranium, for a nominal amount which resulted in a gain on disposal of A$454,468 relating to prior exchange differences on translation of Golden Eagle Uranium that have been transferred from the foreign currency translation reserve. · no changes in tax legislation adversely affect the Group in realising the benefit. Deferred tax assets have not been recognised in respect to tax losses because it is not probable that future taxable profit will be available against which the Group can utilise the benefits. The Company and its wholly-owned Australian resident entities have formed a tax consolidated group and are therefore taxed as a single entity. The head entity within the tax consolidated group is Salt Lake Potash Limited. The carrying value of plant and equipment held under finance leases at 30 June 2018 was $55,857 (2017: $64,036). Additions during the year include $Nil (2017: $64,036) of plant and equipment under finance lease. Salt Lake holds a number of large salt lake brine projects (Projects) in Western Australia and the Northern Territory, each having potential to produce highly sought after Sulphate of Potash (SOP) for domestic and international fertiliser markets. – Trade payables are non-interest bearing and are normally settled on 30-day terms. 1 Shares issued to a key consultant of the Company in lieu of fees. The rights attaching to fully paid Ordinary Shares (Ordinary Shares) arise from a combination of the Company’s Constitution, statute and general law. Ordinary Shares issued following the exercise of Unlisted Options in accordance with Note 14(c) or Performance Shares in accordance with Note 14(d) or Performance Rights in accordance with Note 14(e) will rank equally in all respects with the Company’s existing Ordinary Shares. Copies of the Company’s Constitution are available for inspection during business hours at the Company’s registered office. The clauses of the Constitution contain the internal rules of the Company and define matters such as the rights, duties and powers of its shareholders and directors, including provisions to the following effect (when read in conjunction with the Corporations Act 2001 or the listing rules of the ASX and AIM (Listing Rules)). The issue of shares in the capital of the Company and options over unissued shares by the Company is under the control of the Directors, subject to the Corporations Act 2001, ASX Listing Rules and any rights attached to any special class of shares. Directors may call a meeting of members whenever they think fit. Members may call a meeting as provided by the Corporations Act 2001. The Constitution contains provisions prescribing the content requirements of notices of meetings of members and all members are entitled to a notice of meeting. A meeting may be held in two or more places linked together by audio-visual communication devices. A quorum for a meeting of members is two shareholders. The Company holds annual general meetings in accordance with the Corporations Act 2001 and the Listing Rules. Subject to any rights or restrictions at the time being attached to any shares or class of shares of the Company, each member of the Company is entitled to receive notice of, attend and vote at a general meeting. Resolutions of members will be decided by a show of hands unless a poll is demanded. On a show of hands each eligible voter present has one vote. However, where a person present at a general meeting represents personally or by proxy, attorney or representative more than one member, on a show of hands the person is entitled to one vote only despite the number of members the person represents. On a poll each eligible member has one vote for each fully paid share held and a fraction of a vote for each partly paid share determined by the amount paid up on that share. The Company’s Constitution can only be amended by a special resolution passed by at least three quarters of the members present and voting at a general meeting of the Company. At least 28 days’ written notice specifying the intention to propose the resolution as a special resolution must be given. Provided the Company remains admitted to the Official List of the ASX, then despite anything in its Constitution, no act may be done that is prohibited by the Listing Rules, and authority is given for acts required to be done by the Listing Rules. The Company’s Constitution will be deemed to comply with the Listing Rules as amended from time to time. The share-based payments reserve is used to record the fair value of Unlisted Options, Performance Rights and Performance Shares issued by the Group. · 400,000 Unlisted Options exercisable at $0.70 each on or before 30 June 2021. · No application for quotation of the Unlisted Options will be made by the Company. – 10,000,000 Performance Shares subject to Class C Milestone: The commencement of construction activities for a mining operation on all or part of the Project Licences (including the commencement of ground breaking for the construction of infrastructure and/or processing facilities) following a final investment decision by the Board as per the project development schedule and budget in accordance with the Definitive Feasibility Study, within five years from the date of issue. · The Performance Shares are not transferable. – 1,350,000 Performance Rights subject to the Production Milestone expiring on 30 June 2021. · No application for quotation of the Performance Rights will be made by the Company. As at balance date, 4,400,000 Unlisted Options (which represent 4,400,000 potential Ordinary Shares), 22,500,000 Performance Shares (which represent 22,500,000 potential Ordinary Shares) and 5,400,000 Performance Rights (which represent 5,400,000 potential Ordinary Shares) were considered non-dilutive as they would decrease the loss per share. No securities have been issued since 30 June 2018. There have been no other conversions to, calls of, or subscriptions for Ordinary Shares or issues of potential Ordinary Shares since the reporting date and before the completion of this financial report. (i) Peak Coal was deregistered in April 2018. Salt Lake Potash Limited is the ultimate parent of the Group. Balances and transactions between the Company and its subsidiaries, which are related parties of the Company, have been eliminated on consolidation and are not disclosed in this note. Transactions with Key Management Personnel, including remuneration, are included at Note 18. Apollo Group Pty Ltd, a Company of which Mr Mark Pearce is a Director and beneficial shareholder, was paid or is payable $150,000 (2017: $150,000) for the provision of serviced office facilities, corporate and administration services for the year ended 30 June 2018. The amount is based on a monthly retainer due and payable in advance, with no fixed term, and is able to be terminated by either party with one month’s notice. At 30 June 2018, $25,000 (2017: $12,500) was included as a current liability in the Statement of Financial Position. The Company has not entered into any guarantees in relation to its subsidiaries. Refer to Note 23 for details of contingent assets and liabilities. From time to time, the Group provides incentive Unlisted Options and Performance Rights to officers, employees, consultants and other key advisors as part of remuneration and incentive arrangements. The number of options or rights granted, and the terms of the options or rights granted are determined by the Board. Shareholder approval is sought where required. In the current and prior year, the Company has also granted shares in lieu of payments to a consultant in accordance with the terms of engagement. At 30 June 2018, the weighted average remaining contractual life of Unlisted Options on issue that had been granted as share-based payments was 2.39 years (2017: 2.93 years) and of Performance Rights on issue that had been granted as share-based payments was 1.75 years (2017: 2.5 years). At 30 June 2018, the range of exercise prices of Unlisted Options on issue that had been granted as share-based payments was $0.40 to $0.70 (2017: $0.40 to $0.60). Performance Rights have no exercise price. The weighted average fair value of Unlisted Options granted as share-based payments by the Group during the year ended 30 June 2018 was $0.231 (2017: nil) and of Performance Rights granted as share-based payments was $0.486 (2017: $0.496). The fair value of the equity-settled share options granted is estimated as at the date of grant using the Binomial option valuation model taking into account the terms and conditions upon which the Unlisted Options were granted. The fair value of Performance Rights granted is estimated as at the date of grant based on the underlying share price (being the five day volume weighted average share price prior to issuance). 1 The expected life of the Performance Rights is based on the expiry date of the performance rights as there is limited track record of the early conversion of performance rights. 2 The fair value of Performance Rights granted is estimated as at the date of grant based on the underlying share price (being the five day volume weighted average share price prior to issuance). 3 Subsequent to grant, the expiry date was amended to 31 December 2018 following Shareholder approval on 11 June 2018. This has no impact on the fair value of the securities, however the period that the expense is being recognised over has been modified. 4 Subsequent to grant, the expiry date was amended to 31 December 2019 following Shareholder approval on 11 June 2018. This has no impact on the fair value of the securities, however the period that the expense is being recognised over has been modified. The auditor of Salt Lake Potash Limited is Ernst and Young. The Group’s principal financial instruments comprise receivables, payables, finance leases, cash and short-term deposits. The main risks arising from the Group’s financial instruments are credit risk, liquidity risk and interest rate risk. This note presents information about the Group’s exposure to each of the above risks, its objectives, policies and processes for measuring and managing risk, and the management of capital. Other than as disclosed, there have been no significant changes since the previous financial year to the exposure or management of these risks. The Group manages its exposure to key financial risks in accordance with the Group’s financial risk management policy. Key risks are monitored and reviewed as circumstances change (e.g. acquisition of a new project) and policies are revised as required. The overall objective of the Group’s financial risk management policy is to support the delivery of the Group’s financial targets whilst protecting future financial security. Given the nature and size of the business and uncertainty as to the timing and amount of cash inflows and outflows, the Group does not enter into derivative transactions to mitigate the financial risks. In addition, the Group’s policy is that no trading in financial instruments shall be undertaken for the purposes of making speculative gains. As the Group’s operations change, the Directors will review this policy periodically going forward. The Board of Directors has overall responsibility for the establishment and oversight of the risk management framework. The Board reviews and agrees policies for managing the Group’s financial risks as summarised below. Credit risk is the risk of financial loss to the Group if a customer or counterparty to a financial instrument fails to meet its contractual obligations. This arises principally from cash and cash equivalents and trade and other receivables. With respect to credit risk arising from cash and cash equivalents, the Group’s exposure to credit risk arises from default of the counter party, with a maximum exposure equal to the carrying amount of these instruments. Where possible, the Group invests its cash and cash equivalents with banks that are rated the equivalent of investment grade and above. The Group’s exposure and the credit ratings of its counterparties are continuously monitored and the aggregate value of transactions concluded is spread amongst approved counterparties. The Group does not have any significant customers and accordingly does not have significant exposure to bad or doubtful debts. Trade and other receivables comprise interest accrued and GST refunds due. Where possible the Consolidated Entity trades only with recognised, creditworthy third parties. Receivable balances are monitored on an ongoing basis with the result that the Group’s exposure to bad debts is not significant. At 30 June 2018, none (2017 none) of the Group’s receivables are past due. Liquidity risk is the risk that the Group will not be able to meet its financial obligations as they fall due. The Board’s approach to managing liquidity is to ensure, as far as possible, that the Group will always have sufficient liquidity to meet its liabilities when due. At 30 June 2018 and 2017, the Group had sufficient liquid assets to meet its financial obligations. The contractual maturities of financial liabilities, including estimated interest payments, are provided below. There are no netting arrangements in respect of financial liabilities. The Group does not have any long-term borrowing or long term deposits, which would expose it to significant cash flow interest rate risk. The Group currently does not engage in any hedging or derivative transactions to manage interest rate risk. The Group defines its Capital as total equity of the Group, being $7,019,989 as at 30 June 2018 (2017: $17,046,443). The Group manages its capital to ensure that entities in the Group will be able to continue as a going concern while financing the development of its projects through primarily equity based financing. The Board’s policy is to maintain a strong capital base so as to maintain investor, creditor and market confidence and to sustain future development of the business. Given the stage of development of the Group, the Board’s objective is to minimise debt and to raise funds as required through the issue of new shares. There were no changes in the Group’s approach to capital management during the year. During the next 12 months, the Group will continue to explore project financing opportunities, primarily consisting of additional issues of equity. · Level 1 – the fair value is calculated using quoted prices in active markets. · Level 2 – the fair value is estimated using inputs other than quoted prices included in Level 1 that are observable for the asset or liability, either directly (as prices) or indirectly (derived from prices). · Level 3 – the fair value is estimated using inputs for the asset or liability that are not based on observable market data. At 30 June 2018 and 30 June 2017, the carrying value of the Group’s financial assets and liabilities approximate their fair value. As at the date of this report, no contingent assets had been identified in relation to the 30 June 2018 financial year. As at the date of this report, no contingent liabilities had been identified in relation to the 30 June 2018 financial year. (ii) On 10 August 2018, the Company appointed Mr Clint McGhie as Company Secretary and Chief Financial Officer following the resignation of Mr Sam Cordin. There were 1,135 holders of less than a marketable parcel of Ordinary Shares. See Note 13(b) of the Notes to the Financial Statements. As at 31 August 2018, there are 5,400,000 Performance Rights issued under an employee incentive scheme. There is currently no on-market buyback program for any of Salt Lake Potash Limited’s listed securities. Salt Lake’s Mineral Resource Statement as at 30 June 2018 is grouped by deposit, all of which form part of the Lake Wells SOP in Western Australia. To date, no Ore Reserves have been reported for these deposits. Subsequent to 30 June 2018, the Company reported a Mineral Resource Estimate for Lake Way. The Lake Way Mineral Resource does not form part of this statement. The Company engages external consultants and Competent Persons (as determined pursuant to the JORC Code 2012) to prepare and estimate the Mineral Resources. Management and the Board review these estimates and underlying assumptions for reasonableness and accuracy. The results of the Mineral Resource estimates are then reported in accordance with the requirements of the JORC Code 2012 and other applicable rules (including ASX Listing Rules). Where material changes occur during the year to the project, including the project’s size, title, exploration results or other technical information, previous resource estimates and market disclosures are reviewed for completeness. The Company reviews its Mineral Resources as at 30 June each year. A revised Mineral Resource estimate will be prepared as part of the annual review process where a material change has occurred in the assumptions or data used in previously reported Mineral Resources. However, there are circumstances where this may not be possible (e.g. an ongoing drilling programme), in which case a revised Mineral Resource estimate will be prepared and reported as soon as practicable. In November 2015, the Company reported its maiden JORC Mineral Resource estimate for the Lake Wells Project, totalling 29 million tonnes (Mt) of Sulphate of Potash (SOP) with approximately 80% in the ‘Measured’ category with excellent brine chemistry of 4,009 mg/L Potassium (K), 19,175 mg/L (SO4). The resource was calculated only on the upper 16 metres of the Lake, with mineralisation remaining open at depth across most of the Lake. In February 2016, an expanded Mineral Resource Estimate (MRE) was calculated at Lake Wells totalling 80-85 million tonnes of SOP. This represents an additional 51-56 Mt of Inferred Resource calculated in the strata below the previously reported shallow Resource of 29 Mt. During the year ended 30 June 2018, the Company continued exploration and development activities for Lake Wells including surface aquifer characterisation (test pits and trenches), deep aquifer exploration, long term pump testing, evaporation pond trials and process testwork. In addition, in March 2018, the Company released an initial estimate of Exploration Targets for eight of the nine lakes comprising the GSLP. The ninth lake, Lake Wells (as discussed above) already has a Mineral Resource reported in accordance with the JORC code. The total “stored” Exploration Target for the GSLP is 290Mt – 458Mt of contained SOP, with an average SOP grade of 4.4 – 7.1kg/m3 (including Lake Wells’ Mineral Resource of 80-85Mt). On a “drainable” basis the total Exploration Target ranges from 26Mt – 153Mt of SOP. The total playa area of the lakes is approximately 3,312km2. The potential quantity and grade of this Exploration Target is conceptual in nature. There has been insufficient exploration to estimate a Mineral Resource and it is uncertain if further exploration will result in the estimation of a Mineral Resource. As a result of the annual review of the Company’s Mineral Resources, there has been no change to the Mineral Resources reported for the Lake Wells Project in February 2016 as at 30 June 2018. The information in this Mineral Resource Statement that relates to Mineral Resources is based on, and fairly represents, information compiled by Mr Ben Jeuken, a Competent Person, who is a member Australian Institute of Mining and Metallurgy. Mr Jeuken is employed by Groundwater Science Pty Ltd, an independent consulting company. Mr Jeuken has sufficient experience, which is relevant to the style of mineralisation and type of deposit under consideration and to the activity, which he is undertaking to qualify as a Competent Person as defined in the 2012 Edition of the ‘Australasian Code for Reporting of Exploration Results, Mineral Resources and Ore Reserves’. Mr Jeuken has approved the Mineral Resource Statement as a whole and consents to its inclusion in the form and context in which it appears. The information in this report that relates to the Lake Way Mineral Resource is extracted from the report entitled ‘Scoping Study for Low Capex, High Margin Demonstration Plant at Lake Way’ dated 31 July 2018. This announcement is available to view on www.saltlakepotash.com.au. The information in the original ASX Announcement that related to Mineral Resources was based on, and fairly represents, information compiled by Mr Ben Jeuken, who is a member Australian Institute of Mining and Metallurgy and a member of the International Association of Hydrogeologists. Mr Jeuken is employed by Groundwater Science Pty Ltd, an independent consulting company. Mr Jeuken has sufficient experience, which is relevant to the style of mineralisation and type of deposit under consideration and to the activity, which he is undertaking to qualify as a Competent Person as defined in the 2012 Edition of the ‘Australasian Code for Reporting of Exploration Results, Mineral Resources and Ore Reserves’. Salt Lake Potash Limited confirms that it is not aware of any new information or data that materially affects the information included in the original market announcement and, in the case of estimates of Mineral Resources, that all material assumptions and technical parameters underpinning the estimates in the relevant market announcement continue to apply and have not materially changed. Salt Lake Potash Limited confirms that the form and context in which the Competent Person’s findings are presented have not been materially modified from the original market announcement. The information in this report that relates to the Lake Wells Mineral Resource is extracted from the reports entitled ‘Lake Wells Resource Increased by 193% to 85Mt of SOP’ dated 22 February 2016 and ‘Significant Maiden SOP Resource of 29Mt at Lake Wells’ dated 11 November 2015. These announcements are available to view on www.saltlakepotash.com.au. The information in the original ASX Announcements that related to Mineral Resources was based on, and fairly represents, information compiled by Mr Ben Jeuken, who is a member Australian Institute of Mining and Metallurgy and a member of the International Association of Hydrogeologists. Mr Jeuken is employed by Groundwater Science Pty Ltd, an independent consulting company. Mr Jeuken has sufficient experience, which is relevant to the style of mineralisation and type of deposit under consideration and to the activity, which he is undertaking to qualify as a Competent Person as defined in the 2012 Edition of the ‘Australasian Code for Reporting of Exploration Results, Mineral Resources and Ore Reserves’. Salt Lake Potash Limited confirms that it is not aware of any new information or data that materially affects the information included in the original market announcement and, in the case of estimates of Mineral Resources, that all material assumptions and technical parameters underpinning the estimates in the relevant market announcement continue to apply and have not materially changed. Salt Lake Potash Limited confirms that the form and context in which the Competent Person’s findings are presented have not been materially modified from the original market announcement. The Lake Wells Production Target stated in this report is based on the Company’s Scoping Study as released to the ASX on 29 August 2016. The information in relation to the Production Target that the Company is required to include in a public report in accordance with ASX Listing Rule 5.16 and 5.17 was included in the Company’s ASX Announcement released on 29 August 2016. The Company confirms that the material assumptions underpinning the Production Target referenced in the 29 August 2016 release continue to apply and have not materially changed. This report contains ‘forward-looking information’ that is based on the Company’s expectations, estimates and projections as of the date on which the statements were made. This forward-looking information includes, among other things, statements with respect to pre-feasibility and definitive feasibility studies, the Company’s business strategy, plans, development, objectives, performance, outlook, growth, cash flow, projections, targets and expectations, mineral reserves and resources, results of exploration and related expenses. Generally, this forward-looking information can be identified by the use of forward-looking terminology such as ‘outlook’, ‘anticipate’, ‘project’, ‘target’, ‘potential’, ‘likely’, ‘believe’, ‘estimate’, ‘expect’, ‘intend’, ‘may’, ‘would’, ‘could’, ‘should’, ‘scheduled’, ‘will’, ‘plan’, ‘forecast’, ‘evolve’ and similar expressions. Persons reading this news release are cautioned that such statements are only predictions, and that the Company’s actual future results or performance may be materially different. Forward-looking information is subject to known and unknown risks, uncertainties and other factors that may cause the Company’s actual results, level of activity, performance or achievements to be materially different from those expressed or implied by such forward-looking information. Forward-looking information is developed based on assumptions about such risks, uncertainties and other factors set out herein, including but not limited to the risk factors set out in Schedule 2 of the Company’s Notice of General Meeting and Explanatory Memorandum dated 8 May 2015.